Commemorations were held in Budapest on Sunday, to mark Holocaust Remembrance Day, the anniversary of the liberation of the Auschwitz-Birkenau death camp in 1945. 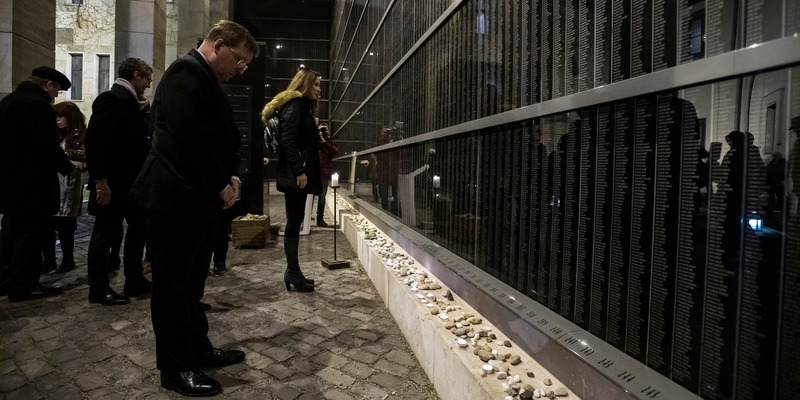 Gergely Gulyás, the head of the Prime Minister’s Office, said in his address at a ceremony held at the Holocaust Memorial Centre that the Hungarian state had “failed to protect its citizens at the time of the Holocaust”. “There was no collective crime, responsibility lay on the state,” he said. Referring to political developments in Hungary before WWII, Gulyás said that “Hungarian society was not left untouched by an increasing anti-Semitism, which was manifested by untolerable curbing of the rights of Jews”. “It is a fact that Jews were deported after Hungary’s German occupation, however, all that could not have happened without participation by the Hungarian administration”. Israeli Ambassador Yosef Amrani said that the Holocaust is an “incomprehensible, indescribable tragedy, which we must remember”. He added that it is a “moral obligation for us to remind other people of the tragedy that happened to us” so that nobody in the future could become a “target for extermination”. András Heisler, head of the federation of Hungarian Jewish communities (Mazsihisz) said at another commemoration that the Holocaust is not an “internal affair” for the community, but an issue concerning the whole of society. “Real freedom is if the obligation to remember rests on the whole of society and society jointly counters efforts to falsify history,” he said. “Remembrance must be universal; Jews and non-Jews, the successors of winning and losing powers must jointly and honestly face the facts,” Heisler said.